My tea friends, have you ever gazed at the leaves resting at the bottom of the empty pot of tea and imagine there are shapes and stories to be found? Well, you may be interested in Tasseography, or the art of reading tea leaves to predict the future. Wouldn’t it be fun to try and tell the fortunes of you and your friends? Char was known to dabble a bit in the art of tea leaf reading, and Kat is planning a party around the mystical event. Tea leaf reading began in the 17th century, soon after tea was introduced to Europe. You can even find vintage cups that were created specifically for reading leaves, but any cup will really do. When Kat was starting to consider reading leaves, I volunteered for the job of course! I love getting the extra added attention. Brew a cup of tea with about a teaspoon of leaves, and keep the leaves in the water. If you are using tea leaves and not an herbal, let it sit for only a minute or so. Since the leaves will remain in the cup, you don’t want it to get too bitter! Herbals can steep a little longer. Try to clear your mind and meditate while you are waiting. You need to be relaxed and ready to focus on the leaves. Once it has steeped you can either pour out the liquid (I quake in my saucer at the thought!) or let the drinker relax and enjoy the cup of tea. The sipper should try to avoid any leaves that may be floating, and either think about a question they’d like answered, or simply clear the mind. Once the brew is nearly done, swirl the cup three times, and turn it over onto a saucer. Shake the cup (gently! We are delicate! ), and make sure the liquid has drained out. You’ll want a napkin or tea towel close by in case it gets a bit messy. Once the liquid is gone, flip the cup back over and you are ready to have a look at the leaves left inside. Begin near the handle and read clockwise. If the cup doesn’t have a handle, start at 12 o’clock. Pick up the cup and twist it around a bit, looking at all of the leaves. Look for any patterns and shapes you can identify. Relax, enjoy, and take your time. Write down the symbols you see, and a personal meaning for them. You may see a letter that corresponds to someone’s name, or maybe an event or object. Here is a helpful guide for common symbols and their interpretations, and this is a handy symbol guide. So, what do you think? I love that it is another way to interact with your tea and your favorite cup. 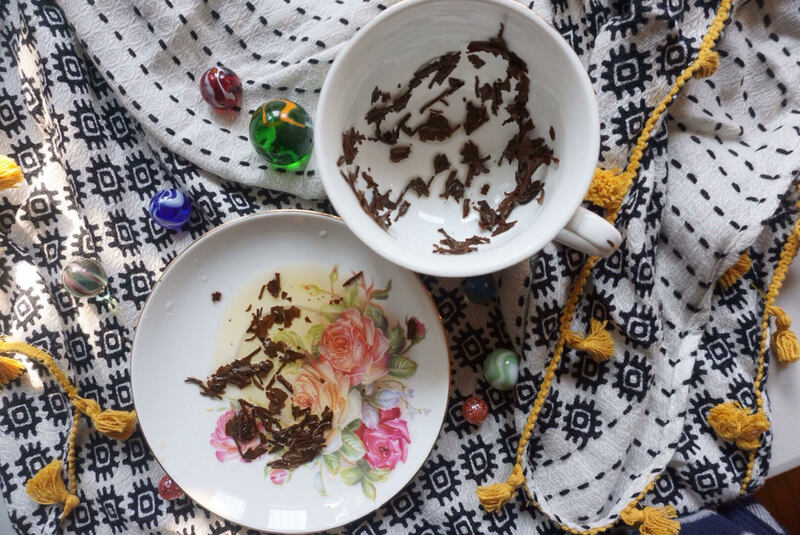 You can read tea leaves just for yourself, or with a group of friends. If you’d like to plan a tea reading party like Kat, make sure you have the cups and leaves ready. You can have your friends choose the cup they’d like to use to give it an even more personal touch. Kat is excited to decorate the room with mystical objects and play mysterious music. Happy tea reading!